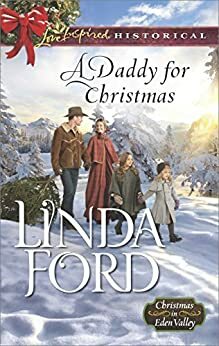 A Daddy for Christmas (Christmas in Eden Valley) - Kindle edition by Linda Ford. Religion & Spirituality Kindle eBooks @ Amazon.com. Summoned by two little girls to help their mother in distress, Blue Lyons rushes to rescue widow Clara Weston. When the cowboy discovers the fatherless family has nowhere to go, he offers them food and shelter. But widower Blue won't get too close to the needy trio. He's lost too many people he's cared for, and he isn't about to set himself up for loss again. For Clara, any dangers she may face on the frontier are preferable to staying with her controlling father. Although she's determined to keep her independence, Blue's kindness and tenderness are hard to resist. Can two pint-size matchmakers help Clara and Blue open their guarded hearts in time for Christmas? Linda Ford lives on a ranch in Alberta, Canada. Growing up on the prairie and learning to notice the small details it hides gave her an appreciation for watching God at work in His creation. Her upbringing also included being taught to trust God in everything and through everything—a theme that resonates in her stories. She and her husband raised fourteen children—ten adopted. She currently shares her home with her husband, a grown son and a live-in paraplegic client. Th e church door clattered open. A cold breeze skittered across the floor as two little girls rushed into the room from beyond the partition of raw wood that separated the entryway from the main part of the partially finished church. They skidded to a halt, staring at him with wide eyes. The peace twenty-eight-year-old Blue Lyons sought so desperately shattered into fragments as tiny and elusive as the sawdust at his feet. "We need help," the bigger girl said, an unfamiliar child with hair the color of caramel candy sticks and heavily lashed eyes as dark as night. "Something's wrong with Mama," the second girl said. This one had sunny-blond hair and blue eyes. At the fear he saw in their expressions, Blue felt cracks begin to form in the barrier he'd erected around his emotions. Then he tightened his self-control. Part of the reason he'd asked to work here, making pews for the new church in town, was to avoid contact with children. Back at Eden Valley Ranch he was surrounded with themsmiling, laughing, chasing, playing, happy children continually threatening the fortifications he'd built around his memories. But these two little girls were alone and frightened. "Whoa. Slow down. Where's your mama, and what does she need?" The pair gasped for air, then closed the distance to his side, apparently unafraid of him as a stranger. Or were they so concerned about their mama they would seek help from anyone? The girls caught his hands, one on each side, and tugged at him. He let them drag him forward as the memory of other occasions burst from the locked vault of his mind. Two other childrena boy and a girlpulling on his hands, eager to show him something. Sometimes it was a new batch of kittens. Sometimes a flower peeking through the snow. Once they'd discovered a baby rabbit hidden in some grass, and the three of them had hunkered down to watch it. The two girls who had burst into his serenity hurried him toward the door. Then, suddenly, one of them halted. "Stop. You need your coat. It's too cold to go out without it." The older one had suddenly grown motherly and concerned. She spied the coat hanging from a nail and dropped his hand to point at it. "Best put it on." He hesitated. He'd like nothing more than to get back to the peace he'd found in his work. But how could he until he made sure everyone was safe? So he obeyed and slipped into his warm winter coat. The girls rocked back and forth, their little faces wreathed in concern and urgency. His nerves twitched at the impatience of the girls, but he would proceed cautiously. "We haven't met. My name is Blue Lyons. I'm going to be working here for a few days, making pews. Do you have a name?" he asked the older child as she twisted her fingers in her worry. "I'm Eleanor. I'm the oldest. I'm eight." The little one piped up. "I'm Libby. I'm seven, so I'm just about as old." She gave her sister a challenging look. Eleanor's dark eyes flashed. "Are not." Little Libby's chin jutted out. "Am, too." Blue did not let the argument escalate. "What's your mama's name, and where is she?" "Mrs. Weston," said Eleanor with a degree of triumph that she had spoken first. "Clara Weston," Libby added, not to be outdone. Reminded of their mission, they again grabbed his hands. "Come on." He let them pull him along, as curious as he was concerned. "Where are we going?" "To Mama," Libby said. "She fell down." His heart lurched. He tried to still it, but it refused to obey. "Is she hurt?" "I don't know." Libby's voice wobbled. Oh, please don't cry. Please don't. Eleanor must have had the same thought, though likely for an entirely different reason. "Libby, don't blubber. We gotta get back to Mama." She sounded so grown-up. The responsible one of the pair. Now why would he think that? He knew nothing about them. He slammed shut the quaking doors of his heart. All he had to do was make sure their mother was safe. No. He would not think the worst. He would not, could not, think of it. They headed for the river. A dozen possibilities rushed at him, none of which he hoped to find. "There she is." Eleanor pointed. With a cry, she broke free and rushed to the figure facedown on the ground. Blue's heart flipped over. His breath stuck in his chest. Libby stopped, pulled Blue to a halt. "She won't wake up," the child wailed as she turned and pressed herself to his side. He couldn't move with her clinging to him. But he must check on the woman. "Eleanor, see to your sister." Eleanor stepped back and pulled Libby to her. The pair stood with their arms around each other, eyes as wide as moons as they watched him. He knelt at Mrs. Weston's side and pressed his fingers to her neck to check for a pulse. Good, she was alive. Seeing no sign of injury, he rolled her over. "Mrs. Weston, wake up." No response. He patted her cheeks. She felt cold. So very cold. "Clara." He spoke louder. It wasn't right to use her Christian name so freely, but if it got her to wake up, she'd surely forgive him. She stirred, tried to raise her eyelids and failed, then mumbled something. He bent closer. "What did you say?" He made out the words. "My girls." "They're here. They're fine." Then she stilled, and he could get nothing more from her. "Gather up your things," he told the girls. "We're going back to the church." He considered his options for about two and a half seconds. What he was about to do seriously crossed the boundaries he had built around his life as well as overstepped rules of proper conduct. But he didn't see what other choice he had. He scooped Clara Weston into his arms and trotted back to the church. The two little girls tried to keep up but were burdened down with carrying their bags. He didn't wait for them; he rushed into the building. He began to lower Clara to the floor, then realized it was bare and cold. His bedroll was nearby, and Blue kicked it toward the stove and used his boot to spread the bedding. He'd expected he might see some cold weather, so he had brought a supply of furs. Now he saw how right he'd been in thinking ahead, though never in his wildest imagination did he think he might need them to warm up a sick or injured woman. He lowered her to the padding just as the girls entered, yelling for their mama. "What's wrong with her?" Libby demanded, her hands on her hips as if she held Blue responsible. Eleanor hushed her and knelt by her mother's side. "Mr. Blue, is she gonna die?" He wanted to assure them otherwise, but he'd never offer false hope when their mother lay before them so still, her skin so pale it was transparent. "I think the first thing we need to do is get her warmed up. Why don't you two bring me some more firewood?" Eddie Gardiner, owner and operator of Eden Valley Ranch where Blue worked, was always organized and had put a supply of firewood inside, near the back door, so Blue would have dry wood to last him a few days. The girls hustled over and filled their arms. Two chunks of wood each was about all they could carry. He could have done three times that in one trip but that wasn't the reason for getting them to help. The girls needed to be kept busy. He knelt at Clara's side. My, wouldn't she be offended at the familiar way he thought of her and addressed her, but it was hard to be proper and formal when the woman looked ready to expire. "Mrs. Weston. Clara." He rubbed her shoulders, held her icy hands. Why was she out in this weather without adequate clothing? He pulled one of the furs over her and threw some of the wood the girls brought into the stove. "Has your mama been sick?" Libby began to say something, but Eleanor grabbed her hand and jerked it. She spoke for the pair of them. "She's not been sick." He knew everyone in town and the surrounding area. These people were new. Must have been dropped off from the last stage earlier today. Petey, the driver, had immediately headed back to Fort Macleod with four important British investors of one of the nearby ranches. "Is your papa coming for you?" Likely he was one of the many new settlers in the area. "Got no papa," Libby said. "He died." Her words carried a weighty sorrow that he felt in the pit of his stomach. "Libby, remember what Mama said." At Eleanor's warning, Libby clamped her hand over her mouth. Blue nodded. "Were you planning to meet someone?" Silence from both of them. "Where are you going?" His question was met with more stubborn silence, though Libby dropped her hand and looked about to speak. Then she glanced at Eleanor and thought better of it. "Do you girls have a secret?" Eleanor scowled. "Mama said not to tell strangers our secrets." He gave them a faint smile. "That's something to remember most days, but right now your mama needs to get someplace warm and safe, so I think it's okay if you tell me where you're going." Eleanor's face crumpled in what he could only think was confusion. "We can't." They were making this difficult. "I already explained about secrets." "It's not a secret." Eleanor sighed expansively. "We don't know where we're going." Perhaps their mother hadn't given them the information. "Who is meeting you?" This was getting him nowhere. He turned back to Clara. She still lay motionless, her skin tinged a faint blue. He touched her cheek. Still icy cold. "Mrs. Weston, wake up. Open your eyes." The girls knelt beside him. "Mama, wake up." Libby's voice broke, and Eleanor wrapped an arm about her shoulders. "Libby, 'member what Mama said. God will take care of us." Blue kept his opinion to himself. But he didn't see God taking care of these people. Blue was doing it, and he sure didn't consider himself God. Or even godly. If he had a fraction of the power God had, he would have quenched the fire that had consumed his house and killed his family. At the very least, he would have gotten there in time to pull them from the inferno. He'd never forget the leaden weight of his legs when he saw the smoke, saw it was his house and ran until his lungs nearly exploded as he tried to get there to rescue them. "II know." The words stuttered from Libby. "But I asked God to send us food, and He didn't and I'm so hungry." "Me, too," Eleanor whispered and shot Blue a look that seemed to warn him she didn't mean for him to hear. He sat back on his heels. "When did you last eat?" Eleanor's expression grew stubborn, but Libby hung her head and sighed dramatically. "We had supper yesterday. Some biscuits Mama found. And some cold bacon." Eleanor grew thoughtful. "But Mama didn't have any. She said she wasn't hungry. Lots of times she said she wasn't hungry, but I think she was." He considered this latest information. They obviously had no funds. The girls didn't know where they were going or who was meeting them. He was beginning to think no one was. So Clara might be suffering from hunger as well as cold. He wrapped the furs more tightly around her and added another piece of wood to the fire. The heat was enough to make a man sweat buckets, but she was still like a block of ice. The girls patted her cheeks. "Mama." Eleanor's voice caught. Libby laid her head on the furs and sobbed. "What if she never wakes up?" Clara's eyes fluttered. "Lib. Lib." Eleanor nudged her sister. "Look." Libby lifted her head. Both girls grinned when they saw their mother had opened her eyes. "Where am I?" Clara's voice was so faint he almost wondered if he imagined it. He scooted closer so her eyes found him. "You're at the church. You'll be safe now." Clara sighed deeply and closed her eyes again. Her color had improved. The warmth of the fire had done that. She needed one more thing before she'd be on her feet againfoodand he knew where to get some. "Wait here," he instructed the girls. "I'll be back in a few minutes. Watch your mama and make sure she stays warm." He dashed out the back door and trotted over to Bonnie and Claude Morton's. The couple ran the business of feeding travelers and providing baked goods for Macpherson's store. He burst through the door. Bonnie glanced up, a startled look on her face. "You're early for dinner." He planned to take his meals here while he was working on the church. He snatched off his hat and turned it around and around in his fingers. He realized he was nodding while she waited for his answer. He pushed the words from his brain. "Would you have anything ready at the moment?" "I suppose the soup could be served anytime. The bread isn't ready yet, but there are biscuits. There's always biscuits. Macpherson says he can't keep enough of them in the store. Would that suit you?" She reached for a bowl and put it on the table. She thought he meant to eat here. "Ma'am, could you put the soup in a container so I could take it back to the church?" "You're welcome to eat here." "I know, but I need to take it to the church." He would tell her why but not until he had a chance to talk to Clara. For some reason, he felt he had to protect her until she said otherwise. "Very well." She reached for a pint jar. Her hand went to a quart jar. "How about that one?" He indicated a half-gallon jar. With a little chuckle, she filled it. "You are hungry today, aren't you?" He nodded. "And I'll take a bowl." He scooped four from the shelf and tucked them in his pocket, hoping she wouldn't notice. From the way she watched him, her eyes narrowed, he guessed she had. "I suppose you want half a dozen biscuits?" "Yes, please. I'll pay you extra for this." Bonnie and Claude meant to feed him as part of their contribution to the church project, but this was more than one man would eat. He hurried out before she could demand to know what was going on. It wasn't like he could answer her. What were Clara and her daughters doing here? Where were they going? Most of all, how had he managed to get himself involved? This is a cute clean romance. A woman trying to protect her two girls and start a new life for them away from a controlling, demanding father. I liked her determination to prove herself and take care of her girls. I also liked that she learned it's ok to accept help from others, and especially guidance from the Lord. Blue also needed to learn to trust in the Lord again, and learn to love again. This is a cute story. 5.0 out of 5 starsAnother Good For Ms.Ford!!!!! Another good book by this author. I would recommend this book. I've come to realize that Ms. Ford and I have different ideas about what makes a strong heroine. After trying several of her books because the story lines sound promising, I don't think I will be trying anymore because I always seem to face the same disappointment. Clara was unlikeable, unrelatable, and very frustrating. She is domineering, stubborn, selfish and too prideful for her own good. While I can understand her desire to stand on her own two feet and take care of her children, I couldn't relate to her methods. As I'm always telling my own 6 year old, "a part of being a big boy is being able to admit when you can't do it yourself and need help." She was selfish and immature, willing to allow her children to suffer for the sake of her pride and not wanting a handout. While I can appreciate a work ethic that leads her to want to take care of her family, as a mother I have no sympathy for a woman who would jeopardize the safety and well-being of her children for her stubborn pride. She claims it's not pride, but it clearly is. She never admits it to herself or blue, and there is no real remorse for her actions. She lectures her children on the importance of trusting God and not their own plans, but she doesn't do that herself. Throughout the book, she is stuck on her own plans and never really admits that she hasn't been trusting God to lead and provide for her. Overall, I couldn't enjoy this book because Clara was so unlikeable for me. However, the girls were adorable and I did enjoy them, as well as Blue. I adore this story! The town spirit of protectiveness, and how everyone is willing to help stand up for, and help each other as needed, no questions asked. I loved Eleanor and Libby, the daughters of Clara. Those girls have such distinctive personalities, their loyalty to their mother, their trust in God, and the peculiar ways they see the world around them was refreshing. Clara and Blue are both running from their past. Blue lost his family in a fire, and had shut down emotionally and socially ever since. The mother with two daughters, while helping him to build the pews in the church, melt down his defenses, steal a piece of his heart, and make a safe, comfortable home in there. Clara was running from her father, who claimed she wasn't a fit mother, couldn't even take care of herself. Over and over Clara feels that she has to prove to everyone, she is capable, since her father had nearly broken her independent spirit. Within each other, Blue and Clara find not only kindred spirit, but acceptance, respect, equal partners in life. Cute story. It was full of charm. It had some sad history, but hope for a better future. Some drama. A clean read. It was also full of scripture, prayer but not preaching just part of the story. I loved the characters. Blue Lyons had a sad past. He was a loner and tried to stay away from children. He was working in the church making the pews. Clara Weston is a widow with two cute kids. She doesn't want charity. She wants to prove she can take care of her daughters. She is planning to leave as soon as the stage comes back. Eleanor is eight years old and Libby is seven. They pray for different things than their mom. They want to stay where they are. I loved watching them interact with Blue. They helped him so much while he helped them. I really like the series of Cowboys of Eden Valley. I look forward to reading sometime the books that I have missed in the series. I like reading books by Linda Ford. They are uplifting, full of drama, trials and strong characters. I was given A Daddy for Christmas to read from Net Galley and Harlequin. In return I agreed to give a honest review of it.